Most of us by now are probably aware of the benefits of eating whole grains. One of the easiest ways to do this is swapping from white bread to wholemeal. However, the taste is very different and many people prefer sticking to their familiar white loaves. There is a halfway house solution provided by Kingsmill’s 50/50 loaves, Warburtons Half & Half and Hovis’ Best of Both. These look very much like white bread and taste quite similar, but have much more fibre. They do provide a good compromise, but now there’s a new variety on the shelves called Kingsmill Great White. This deliciously soft white bread has as much fibre as wholemeal and tastes just like white bread. Kingsmill’s Great White is available in medium and thick white sliced 750g loaves. It’s high in essential fibre, contains no bits, is suitable for vegetarians and vegans, Kosher SKA, and Halal HFA approved. For as long as I can remember, I haven’t bought white bread. Having been indoctrinated years ago (I’m talking 20+ years here) about the perils of white bread, I converted to wholemeal. I didn’t like the taste at first, but stuck with it and now prefer the wholegrain loaves. These days, each week I buy one wholemeal loaf and one of the 50/50 loaves from Kingsmill, or one from Hovis or Warburtons. This is mainly because my kids, who have never knowingly eaten white bread, always plead with me to buy the 50/50 stuff (they think that it’s white bread)! So last week while in Tesco, I’d just picked up a 50/50 loaf and was about to put it in my basket, when I came across a stack of these new Kingsmill Great White loaves on sale for £1. I picked it up and compared the nutritional details of each loaf and went for the Great White because it had more fibre. 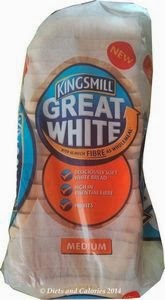 In fact, the Great White has more fibre per 100g than Kingsmill’s Tasty Wholemeal bread. Just like the description, this bread is gorgeously soft and squishy, just like cotton wool when you press into it. 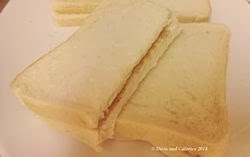 When made into a sandwich, I have to admit, it tastes just like the white bread I remember, far more so than any of the other varieties. It has over twice as much fibre as regular white bread, more fibre than Kingsmill’s Tasty Wholemeal and more fibre than Kingsmill’s 50/50, Hovis Best of Both and Warburton’s Half & Half. See the nutritional breakdown and bread comparisons below. All are low in fat, saturates and sugar but high in salt. Ingredients: Wheat Flour (with Calcium, Iron, Niacin (B3) and Thiamin (B1)), Water, Wheat Fibre (5%), Yeast, Wheat Protein, Salt, Vegetable Oils (Rapeseed, Palm), Vinegar, Emulsifiers: E471, E472e, Soya Flour, Psyllium Fibre, Preservative: Calcium Propionate (added to inhibit mould growth), Flour Treatment Agent: Ascorbic Acid (Vitamin C). As a comparison with the other alternative white loaves, this has to be the closest in taste and texture to white bread that I've discovered. 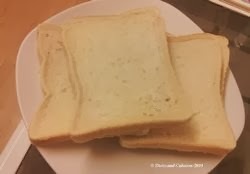 As such, for those who simply prefer the taste of white bread over wholemeal, Kingsmill's Great White is certainly a better choice for fibre content. It also has added Iron, B3 and B1 which the white version doesn't contain. Available in Tesco at the special price of £1 (at the time of writing).